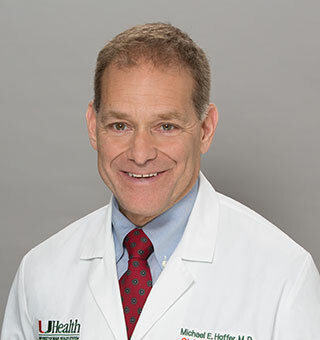 Michael Hoffer, MD, FACS—and his 20-plus years in the Navy studying mild Traumatic Brain Injury (mTBI), tinnitus, hearing loss, and vestibular disorders on active duty service members—offers a tremendous resource to AHRF and its Research Committee. Today, Hoffer is a Professor of Otolaryngology and Neurological Surgery at the University of Miami. As a clinician-scientist, he performs both basic and clinical research along with his Otology/Neurotology practice. Hoffer focuses much of his research on traumatic damage to the inner ear and brain, including pioneering work on the treatment of noise-induced hearing loss and tinnitus, pharmaceutical countermeasures for mTBI, and optimized diagnosis and management of neurosensory disorders seen after mTBI. Hoffer received his MD from the University of California San Diego School of Medicine, did his residency at the University of Pennsylvania, held a Neurotology Fellowship at the Ear Research Foundation, and received his BS in Biology from Stanford University. He has published extensively and received research grants from the Department of Defense, National Institutes of Health, and industry.